If you are looking for a fun tutorial to make burp rags as a baby shower gift or for your new little one, I love Jill's idea of using cute fabric to dress up terry cloth or chenille burp rags. I am not much of a sewer, but I think even I could pull this one off. If I had a surger that is! Lucky for my my sister-in-law just sent me super cute burp cloths, so I don't have to worry about making my own before this little guy shows up! 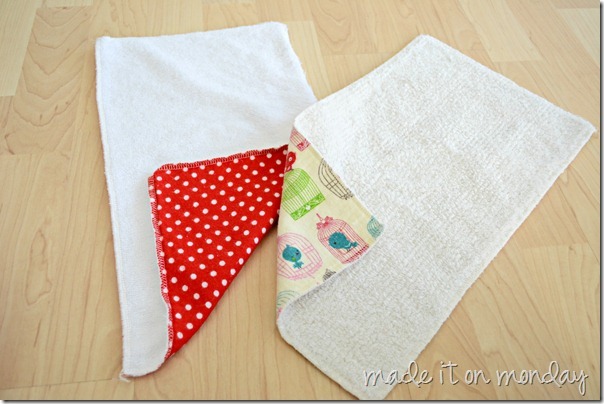 You can check out the perfect burp rag tutorial over at Made It On Monday. Thank you so much for featuring my burp rags!! !